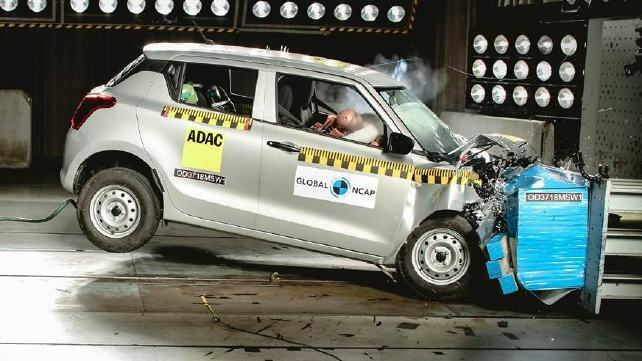 The India-made Maruti Suzuki Swift has scored two stars in the safety test conducted by the Global New Car Assessment Program (GNAP). The new generation Swift is offered with standard safety features like Isofix and two airbags, which is clearly an improvement over the previous generation model. However, the Global NCAP has awarded two stars for the hatchback as it underperformed as compared to the European car which gets side body and curtain airbags with Electronic Stability Control (ESC) as standard. The car offers good protection to the head and neck of the driver and the co-driver, but it underperformed in protection for chest and knee area. The hatchback also misses out on four-channel ABS thereby resulting in scoring two stars each for adult protection and child protection. The test further noted that the child seat was mounted in the forward facing direction and although it prevented excessive forward moment, the chest protection was marginal.